Ex TUG BOAT built in1939 in the Dutch yard FCHEEPWERS and converted into a live aboard cruiser. The access to the interior is from the former wheelhouse by a sliding side door (both sides) now converted into a saloon with a good headroom 2m and view onto the outside. A heads is on this level. From the saloon going to the forward main cabin with a double berth (140 x 190 cm), headroom of 1.78 cm and plenty storage. #Aft : 3 steps down to a large dinette on port side and on starboard a galley. Plenty storage, good headroom of 2m. And further on starboard heads with shower, heads and basin, and a second cabin with double berth (120x190) and a single berth (70 x 190 cm) and a headroom of 1.80m. #Starboard: a stair case leads up to the enclosed helm position which leads through a sedan doors onto a huge covered terrasse to entertain while cruising or dine under shade. 50L electric hot water tank (new in march 2019), hot water for heating by a KABOLA boiler, and also extra electric heater. 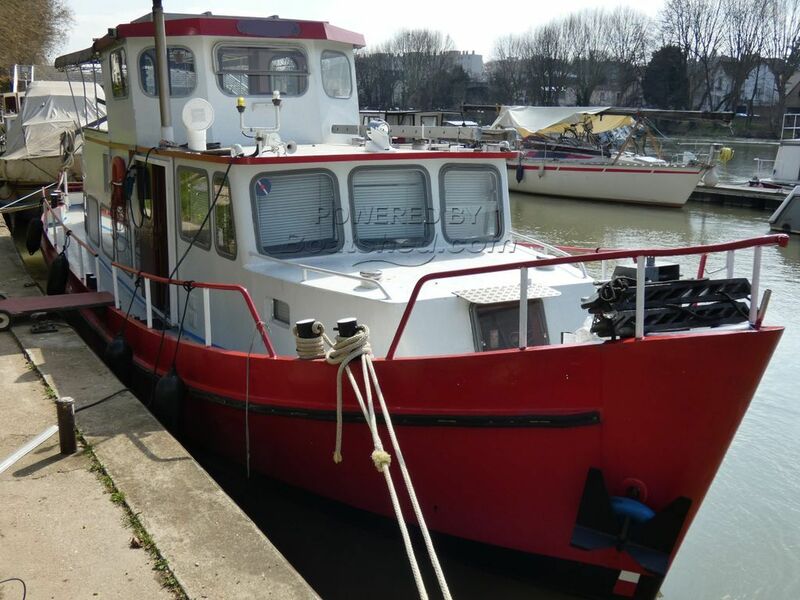 Tug boat converted to residential / cruising boat for sale in France. Boatshed Paris is happy to offer for sale this Dutch Tug built in 1939 and later converted to a live aboard river cruiser for sale in the Paris area. Less than 15 m long but offering great accommodation and character. All the spaces have been used to offer confortable and yet separate spaces, such as 2 cabins, 1 head and 1 shower, An interior saloon in the wheelhouse to enjoy the views and a more intimate dinning area below with the galley. The helm position and new pilot house is on top and accessible form the deck, leading to a huge covered aft deck terrasse. Central heating and reverse cycle air conditioning make this river cruiser a perfect floating home for a couple or a family of 4. Recently surveyed with a new antifouling (last March 2019). This Dutch Steel Motor Cruiser 48ft EX TUG - LIVE ABOARD has been personally photographed and viewed by Pascal GAETAN of Boatshed Paris. Click here for contact details.